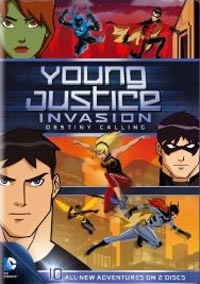 Join Young Justice and watch them battle villains and fight crime in a 2-disc 10 episode collection! For the Young Justice squad being a teenager means proving yourself over and over - to peers, parents, teachers, mentors and, ultimately, to yourself. But what if you're not just a normal teenager? What if you're a teenage super hero? How much harder will it be to prove yourself in a world of super powers, super villains and super secrets? Are you ready to come of age in such a world? Are you ready for life or death rites of passage? Are you ready to join the ranks of the great heroes and prove you're worthy of the Justice League? That's exactly what the members of Young Justice - Robin, Aqualad, Kid Flash, Superboy, Miss Martian and Artemis - will find out . whether they have what it takes to be a proven hero. The latest season of the critically acclaimed series jumps ahead in time 5 years to re-introduce the original squad as well as all new members Nightwing, Wondergirl, Blue Beetle, Batgirl, and Beast Boy as they fight off a secret alien invasion affecting the entire planet. --Rise of the Blue Beetle! --Fall of the Blue Beetle!